Any of you who are regular readers of my Blog will have noticed my posting has significantly dropped off over the past year. There are a number of reasons for this but the most important is frankly I’ve run out of things to say. Actually that’s not even remotely true but I have studied my analytics closely and realized that in general, the posts I’m getting hits on these days aren’t the ones that I write for me… most of my hits are on my reviews, few as they are. That isn’t why I set out to write this Blog and while I’m sincerely thankful for all of you who have read my rants and raves, I don’t get as much out of the process as I once did and I have little interest in becoming a more full-time Blogger in order to falsely increase my followers and readership just through networking. I’ve always wanted a certain type of reader – one who has similar interests to my own or potential clients who are looking for some guidance around what to look for in a services provider. As well, increasingly there is misinformation floating around masquerading as truth regarding all things video and visual and I have little interest in trying to turn up my proverbial “volume” to provide signal above the noise. I have more productive things to do with my time right now and think I’ll spend my energy elsewhere. Danke, merci, спасибо (spasiba), ਸ਼ੁਕਰੀਆ (shukriya), takk and thank you! Hey folks… Feeling pretty philosophical and retrospective today. Over the past 15 years that I’ve been my own boss running video production companies I’ve always found my work through referrals. To be fair, I’ve held two Day Jobs that I applied for where I knew nobody (I worked at a craft brewery for 1 month shortly after I moved to Vancouver and my second health care centre video production job was in response to a Craigslist ad) but in terms of self-employed or business income? All of my work has been referred. Looking back, I’m certainly thankful but I have to say I’m a bit surprised. I reflect on this having just submitted my response to a major corporation’s Request For Service Qualification bid request. I spent approximately 20 hours putting my virtual best foot forward and realized that there isn’t a single person on the inside working on my behalf to get my proposal approved. I respond to a fair number of RFPs over the course of a year and I get over half of them because they come to me from people who I have a professional history with or who have been referred to me by colleagues or clients. Today, I’m just another manila padded envelope with a professionally printed and bound submission. I’m used to doing business with clients who have been referred to me, like Don & Elizabeth who were kind enough to allow me to use them as references and the video we produced for BC Ambulance Service in my RFSQ response. My maternal grandfather was a simple man who grew up on a farm and worked hard his entire life. In his 80s he still cleared snow for his neighbours, the “little old ladies” who were 20 years younger than he. Things were simple in his world: work hard and enjoy the simple things. His grandest praise was reserved for my grandmother’s cooking. She would make simple fare like potatoes, hamburgers in gravy, corn and a fresh apple pie every weekend. To hear grandpa fuss you’d swear she had cooked a meal fit for a king! “Geez mum, that smells good!”, he’d say without fail every time dinner was served. I miss my grandpa. I think he’d be proud of what I’ve done. The bid process had two options for submission: online eBid or hard copy. I delivered mine, smelling like fresh printing always does, in a padded yellow envelope. Just the way I know my grandpa would have. The concept of immortality is an interested one. I have spent nearly the last 20 years trying to leave the world a little bit better than I found it. I recognize that there is an inherent pretentiousness in that comment but please hear me out. Almost 20 years ago, something bad happened that forever changed the lives of myself and a friend and coworker of mine. Since that point, my own mortality and the sense of living with purpose became clear to me. I involved myself as a volunteer giving workplace safety and health presentations to high school age students in the hope of preparing them for the real working world in a way that schools weren’t at that point in time. In total, I spoke to between 15 and 20 thousand students in classroom-size gatherings over several years as a volunteer with SAFE Workers of Tomorrow. I’m proud of that legacy although the time came when I needed to move on to making a difference in another way. 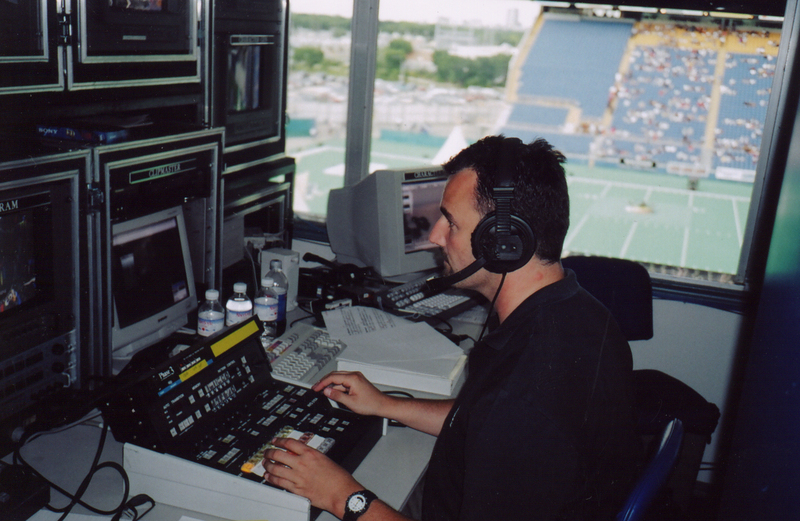 In 2001 I travelled to Brazil and Jamaica with a client of mine on a documentary entitled Home Street Home which highlighted street children in Recife, Brazil and Montego Bay, Jamaica and the aid agencies committed to providing services to them. In Brazil, we visited a garbage dump where children and their families lived in order to be close to their source of “employment”: selecting garbage from the dump as it was brought in on garbage trucks and carrying it out to waiting recyclers who would pay them for it. One young man said that it was a particularly good day when garbage came in from a bakery because then they would all have a party and eat the cakes and other sweets. Later, we met a young mother who, through our interpreter, told us she was afraid because she wasn’t able to find any food or milk for her infant daughter. Only later in the edit bay did we find out the rest of what she had told us (and the translator hadn’t): all she had fed her baby in days was sugar packets she found mixed with with accumulating water from the lowest lying region of the dump, where we were horrified to hear the biological waste from hospitals was unloaded. Shaun shooting from the doorway of “The Church of the Garbage Dump” near Recife, Brazil. In 2004, I committed to producing a video chronicling the effects of the untimely death of a young worker, Michael Skanderberg, during his first week of employment in the role of an electrician’s helper when he was electrocuted while working changing light ballasts. The video was produced after meeting Michael’s mother Cindy Skanderberg and talking with her about the work she was doing in talking to high school age students. 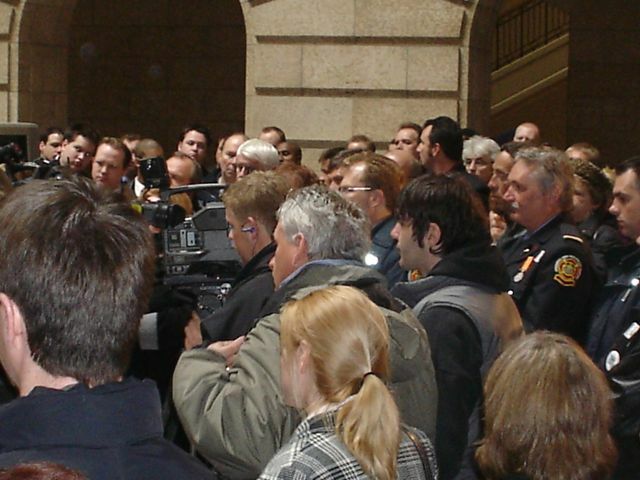 The video was released on April 28th, 2005 at the Day of Mourning ceremonies at the Manitoba Legislature. 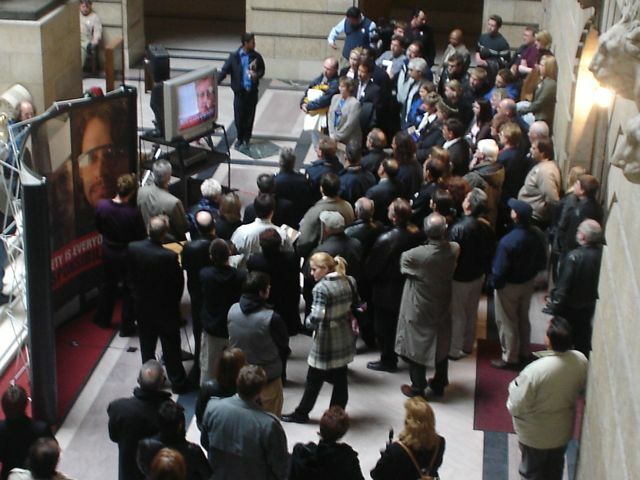 The turnout was inspiring with labour unions, firefighters and emergency personnel, laypersons and politicians gathered in the Grand Staircase to watch the ten minute video called Michael: A Senseless Loss. The video was ahead of its time in that it didn’t document in detail what happened that killed Michael. Instead, I produced a video that examined the sense of loss that Michael’s family and friends experience as a result of his passing. So instead, we introduced the viewers to Michael’s sisters, his mother (who in precise detail explains in front of a high school assembly breathlessly how her son was killed), his grandparents and his buddies. The ceremony was open to the public. 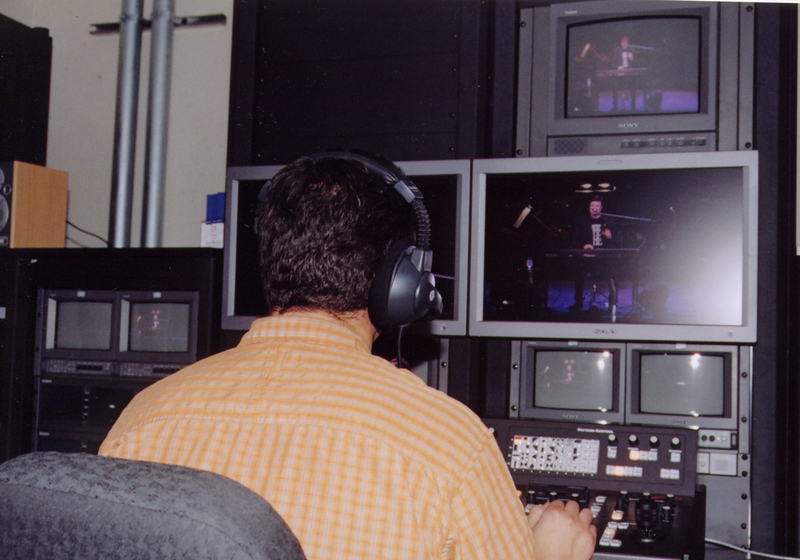 Media were in attendance and we released copies to be included in the evening newscast. Safe Workers of Tomorrow staff preparing to speak around the video. 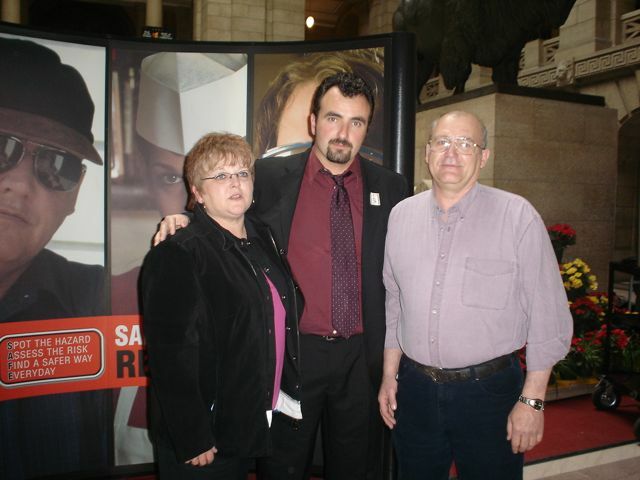 Shaun C. Roemich with Michael’s parents, Bill and Cindy Skanderberg. 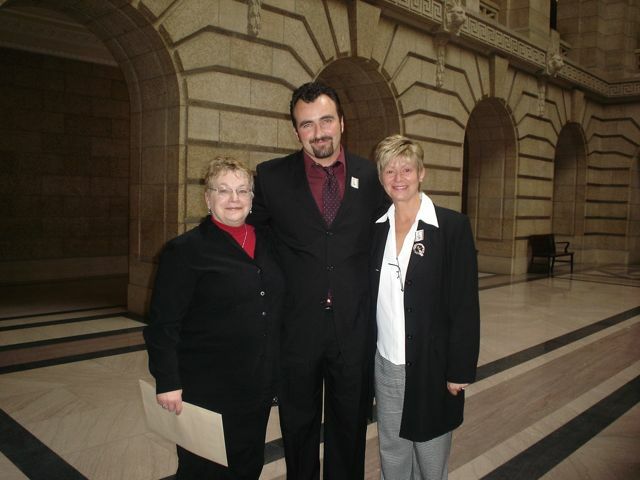 Shaun C. Roemich with SAFE Workers of Tomorrow founder Ellen Olfert and then Minister of Labour for the Province of Manitoba, Nancy Allan. 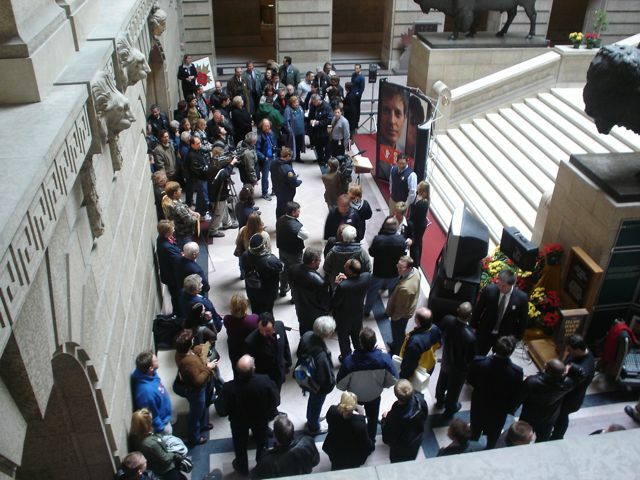 A few weeks later, I was invited to the Legislature gallery as a special guest when word came down that an amendment to the Workplace Safety and Health Act was being introduced in recognition of Michael Skanderberg’s tragic death. I was speechless when I heard my name mentioned in affiliation to this Bill. You can rest assured that I haven’t stopped telling important stories since then. 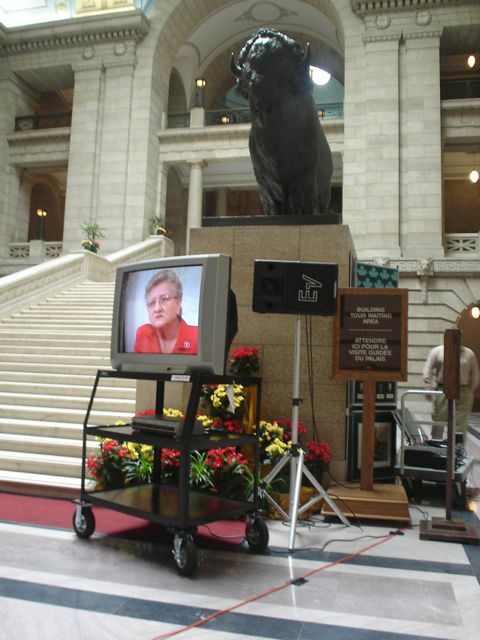 In fact, two summers ago I had the privilege of doing some oral history work for the Canadian Museum for Human Rights. A video project I produced for a client of mine was recently awarded a Canadian Association of Labour Media (CALM) Award for Best Narrative Video or Documentary Series. 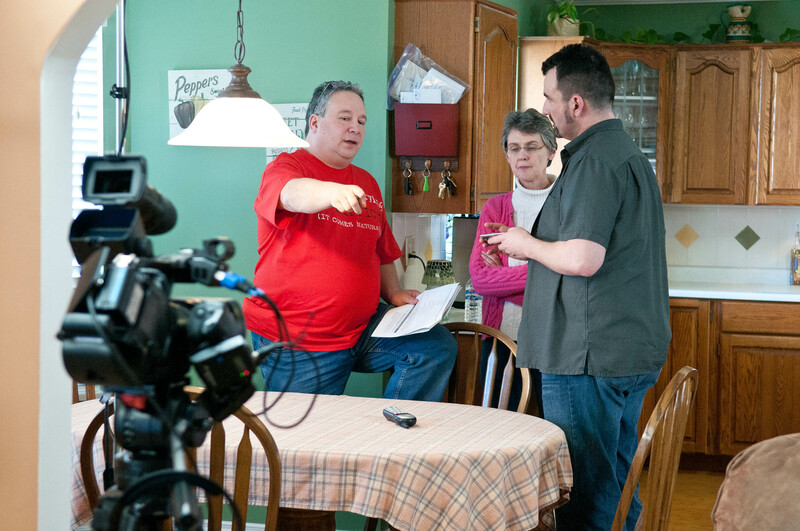 This series explores the issues that Canadian workers are fighting for around sick benefits, pension and parental leave. We also explore the involvement of the Public Service Alliance of Canada in the Idle No More movement and the efforts they make in supporting community agencies working to eradicate poverty, homelessness and establish food security for the working poor. I’ll be honest with you – it isn’t the most lucrative business decision I could have made but I stand by the last 19 years of trying to leave the world a better place. I did more than just show up for this life – I’d like to think I’ll be remembered for what I’ve done. Having watched my Blog analytics closely for the past number of months, it turns out a lot of folks are ending up at my Blog after doing a Google search for Dracast LED lights following my review of my lights last year. In fact, I had a fellow from Ireland email me directly with some very specific questions about Dracast lights. 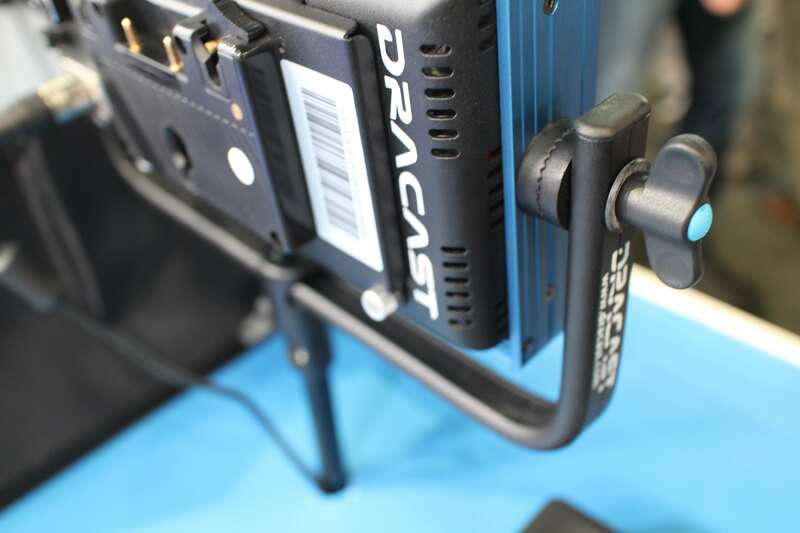 In addition, I have received phone calls from a fellow at Dracast whom I met at NAB this year who has been inquiring about my interest in purchasing more of the lights after a great conversation at NAB. To be clear, I don’t have any of the newly released Dracast lights to review properly but I am generally satisfied with my existing lights, despite the issues I raised previously around construction. I still believe in the company and their products. 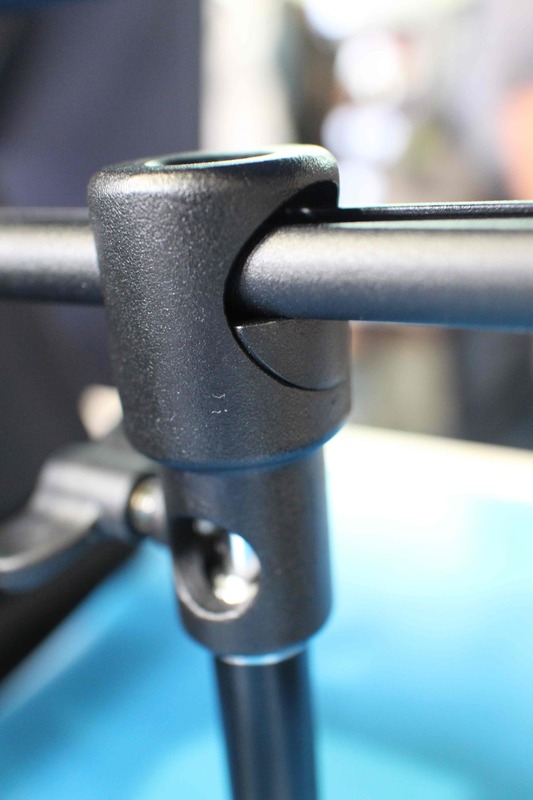 And what I saw at NAB this year instills a lot more confidence in me around their build quality. I felt I owed the lights and you readers a brief update on my non-scientific findings. 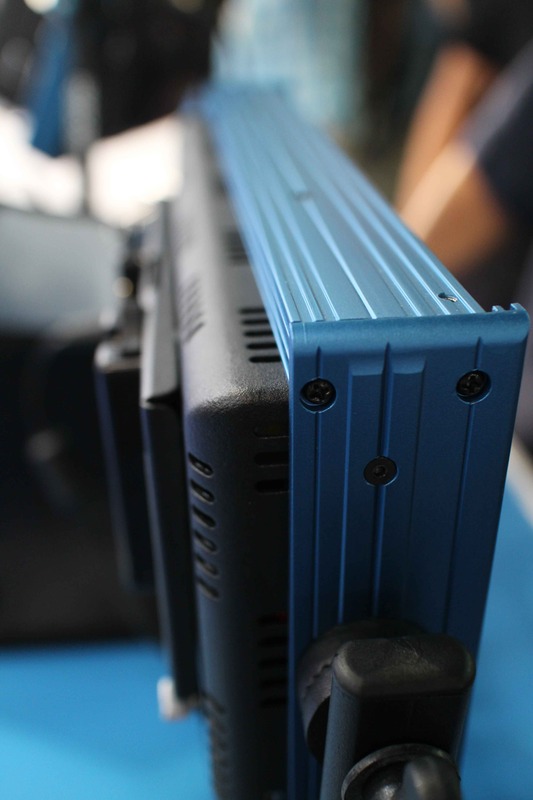 Of course, I would be remiss if I didn’t take at least one cheap shot at the fact that the blue anodized aluminum that features so prominently on the new lights is obviously inspired by the new breed of indie filmmakers who love their coloured anodized everything. 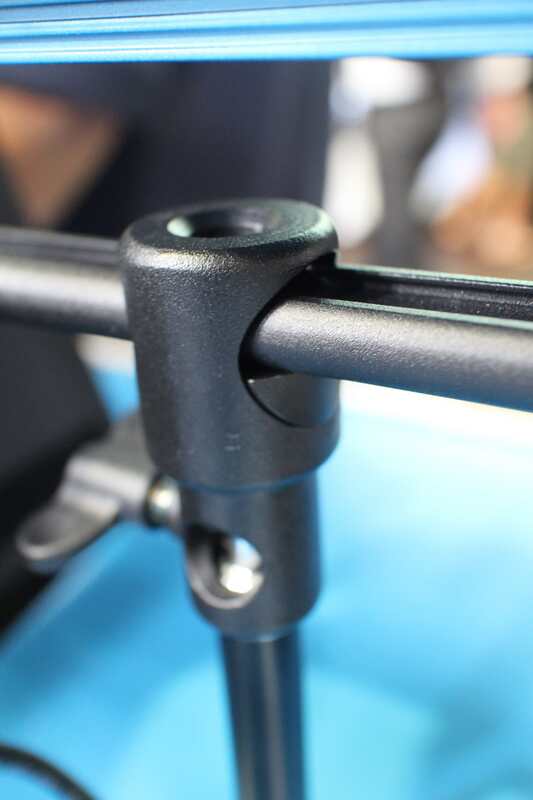 I find it super cheesy on every piece of ciné gear, mostly because I don’t like gear that calls attention to itself. Far too ostentatious for my sensibilities but I’m not the core market for these lights or any of the other gear that gets the “ooooh, shiny!” treatment these days. All in all, construction is now solid. Every single one of my complaints around construction has been addressed in the new series. I didn’t get a chance to touch the AC power transformers to see if they still get hot but somehow I doubt it (yeah… super scientific, I know…) as everything else has gone up several notches. 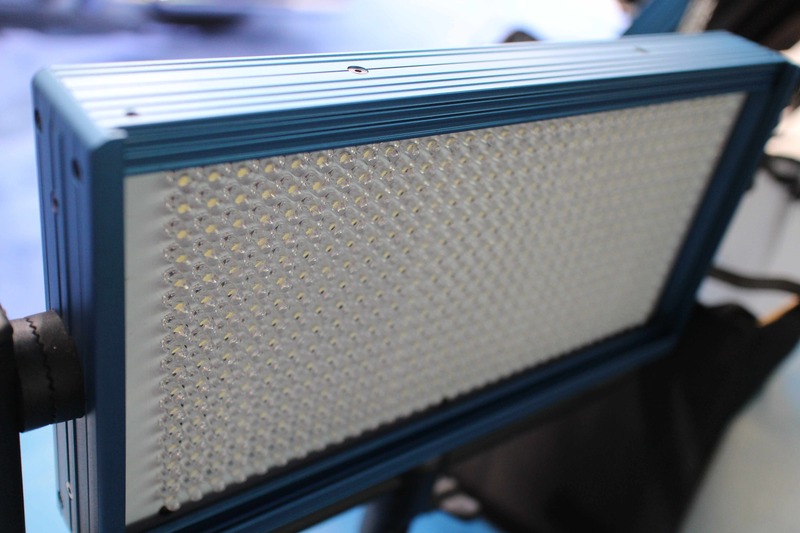 Since I haven’t had a chance to shoot under the new lights I can only assume that things haven’t gotten worse, which means these are still likely to be a very solid performer in the market they serve – they aren’t the cheapest LED panels out there but they aren’t the most expensive either. A very solid “working man’s fixture”. 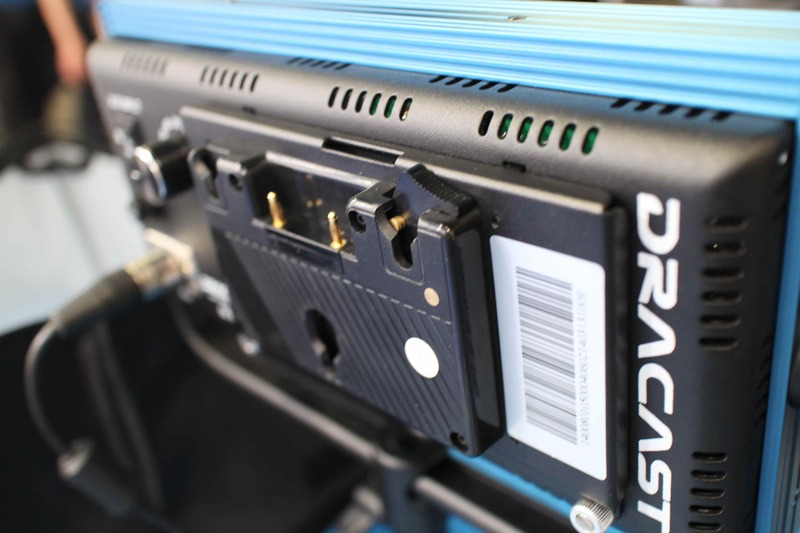 As well, Dracast has been offering some very interesting package deals over the last number of months that add value. 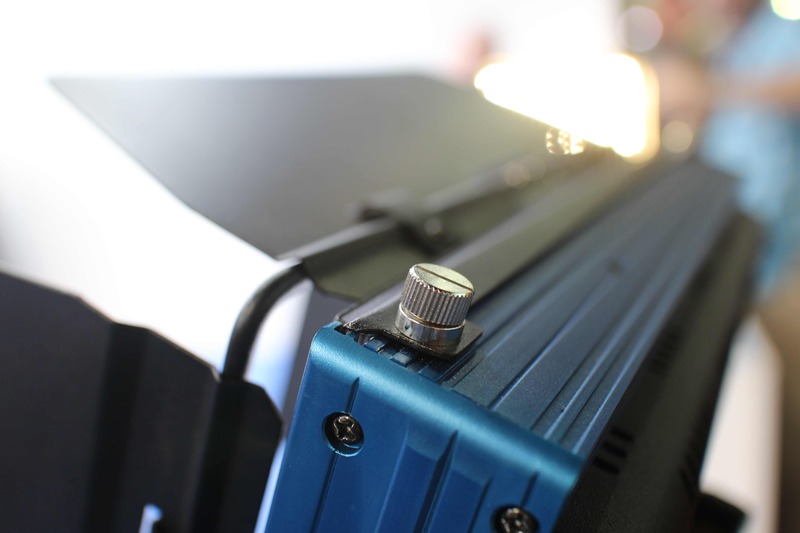 If you are in the market for LED panels and performance and quality mixed with realistic budget is important to you, I’d encourage you to check these out for yourselves. See below for my pictures of the new series panels from NAB using my pocket camera. Disclosure: I have received no compensation or promotion for this mini-review and my previous review is based on instruments I purchased at full retail from an online reseller friend of mine. I attended the NAB Convention at my own cost, excepting the free admission pass to the convention received from Convergent Design who are non-afilliated to Dracast in any way. It’s no secret that I spend a lot of time on the Internet on web forums and reading websites around video production. The advent of inexpensive webhosting and blogging platforms has certainly made it easier to get one’s voice heard. Web forums also give a voice with hundreds or thousands of potential readers. Is that intrinsically a good thing? Does the 10 year old on the playground who yells the loudest have the most accurate information on who is a bigger poopiehead? 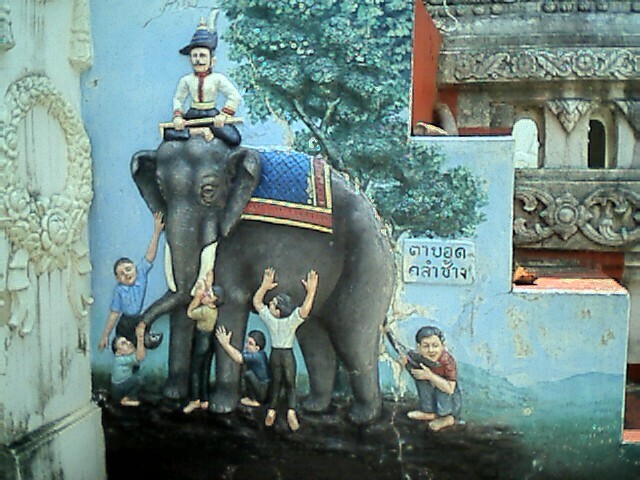 There is a parable that is shared amongst several of the world’s religions about a group of blind men (or men in a darkened room) who deem to investigate an elephant and give an analysis of what an elephant is objectively based on their regional examination of the elephant, which is by definition a subjective analysis. The Wikipedia entry for the parable can be found here. In the early days of the Internet as we know it, it was often referred to as the Information Superhighway. The Web seemed a particularly highbrow place (well… except for adult content and garish Geocities pages) where the nerdy intelligentsia congregated. Information seems to have been replaced for the most part by hyperbole (how I love that word…) and opinion. Social media has replaced information repositories. 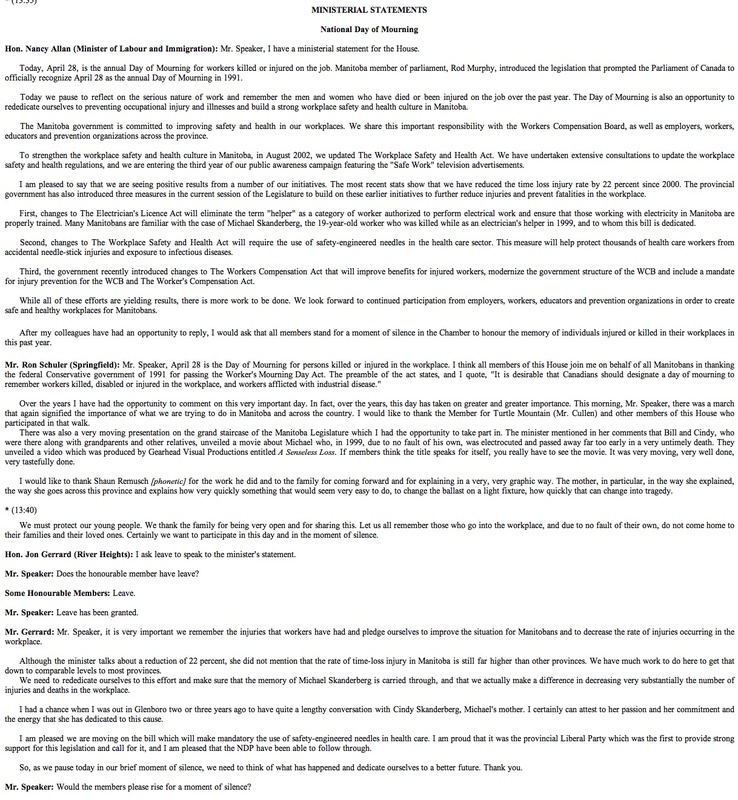 Just like The Cool Kids in school, certain purveyors of opinion and viewpoint are given larger and more grandiose soapboxes to proverbially stand on, as I wrote about in my own Blog post Cult of Personality. I for one try to find the truth and frequently step back to see things from a larger and more inclusive scope. I don’t always succeed and ultimately my world view can only encompass what I’m able to view given the access I can get, the amount of time and energy I’m willing to invest and my willingness to digest datum that I find that contradicts my own suppositions. I encourage well-reasoned discourse and expanding my base of knowledge, which I try to share when and where welcomed. I just find there are fewer and fewer outlets where contrary positions, no matter how well researched or thought out, are received gracefully. I’m not always right but when I’m proven wrong, I try to learn from the experience, unlike these guys.